We continued our trip to Morocco (making use of the excellent and reasonably fast Moroccan railroad that links the major cities). Marrakech is very different from Fes in many respects, the most obvious of which is the extensive use of the rosy stucco that covers nearly all buildings. 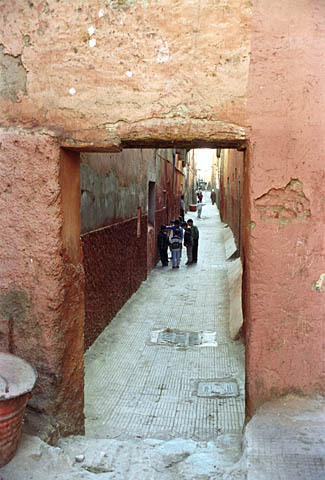 The medina of Marrakech is only carfree in the souk itself; nearly all of the other streets see a moderate level of motorcycle use. The exhaust fumes are not quickly blown out of the narrow streets faced by tall buildings, so air quality at ground level is not good. 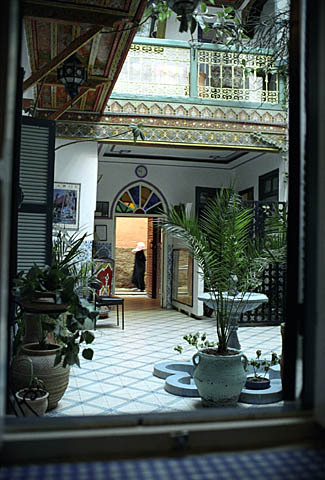 We stayed in this delightful hotel which gives a good understanding of Moroccan architecture. 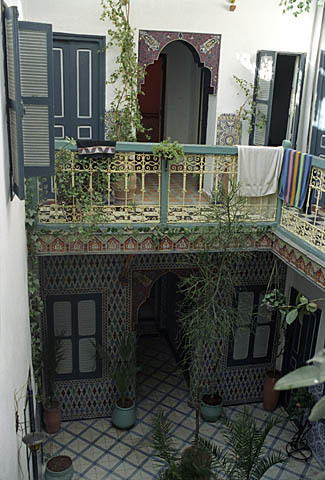 It is a typical courtyard house, and, as can be seen, the small courtyard is the focus of the building. It also includes a roof terrace which sees a great deal of use by guests. The rooms are small but comfortable, and the way they face onto the balconies and courtyard lends an intimate feel to the place. I would have to rate this one of the most satisfying rooms I have ever occupied. Although this is the only window, it certainly affords a lovely view of the courtyard and the street beyond. The fountain and the plants must be especially welcome in the very hot, dusty summers. 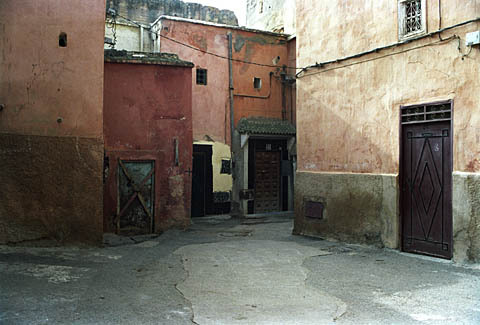 A typical street in an old part of Marrakech. The long, straight streets unfortunately make it possible to use motorcycles even in such narrow streets. Another street scene which conveys my impression of Marrakech - the city seems less welcoming than Fes because so much of the street at eye level is closed off from view. 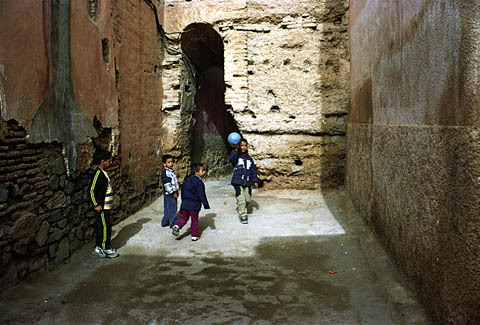 It gives the city a mysterious feel, which I find less enjoyable than the warmth of the Fes medina. This concludes our visit to Morocco. I found it an interesting land full of surprises and yet curiously familiar from my time in South-East Asia. I hope some day to return and make a more thorough photographic documentation of its fascinating medinas.